Win a FREE Celtic Clover Cover by Best Bottoms! 2/24/17 FYSF, Win a Best Bottom Celtic Clover Cover! 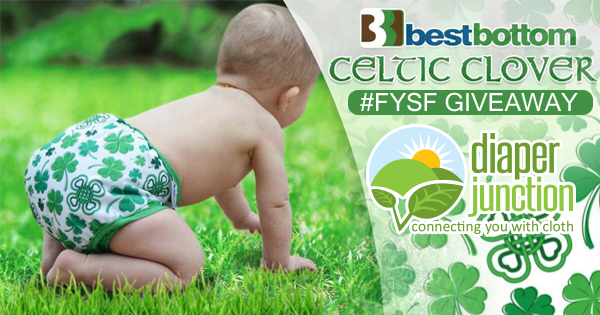 Celtic Clover, Best Bottom Diapers newest limited edition print, is stocking on 3/1/17 at Diaper Junction! This St. Patrick's Day print is sure to be a fun new addition to your cloth diaper stash! Best Bottoms are known for their trim fit and quality absorption. With cloth diapers so thin, your baby can wear jeans without that bulky bum look! You wont find a more simplified cloth diapering system on the market than Best Bottom diaper shells and microfiber or hemp/organic cotton cloth diaper inserts. If you have struggled with pre-folds and fitted diapers, and arent sure that pocket diapers are right for you, Best Bottom Diapers offer the best alternative while allowing you a greener way to care for your baby. This one-size diapering method takes the guesswork out of changing diapers and saves you time and money. This week's giveaway is giving you a chance to win a Celtic Clover Cover totally FREE! Enter to win using the Rafflecopter form below. This contest is open to the USA & Canada. Winner must be 18 years or older. Winner will be notified by email and will have 7 days to reply and claim their prize. Would love to win this diaper!!! Would love a diaper to celebrate one of our family's favorite holidays! I don't have any st. Patrick's gear yet for my little guy! Ahh! Always enter the fysf, but if I won one, this would be my favorite to win! My has band is even dying over this diaper! This is so cute!! ?? Love, love, love this diaper! Super cute, crisp, and fun! LOVE this. My birthday is St. Patrick's Day. ? ?